← Standard Deviation – How Valuable is it? As with almost all cartridge case designs, there is bound to be at least a few aspiring off-spring. The 30 T/C case was no exception. The first notable development was the extremely popular 6.5 Creedmoor. As soon as the 6.5 Creedmoor was released in 2007, a 6mm version was being envisioned. After the 6mm Creedmoor demonstrated its worth at 1,000 yards it began to catch the attention of Precision Rifle Series (PRS) competitors. The 6mm Creedmoor is a great fit for those looking for an AR platform friendly cartridge. It delivers velocities very similar to the .243 Win and yet fits the AR10 magazine length requirement, while allowing long range bullets to be seated for maximize case capacity. The 30 degree shoulder makes this a very efficient case and helps prolong case life as well. The 6mm Creedmoor works well with powders such as H4350, RE-17, and Ramshot Hunter for heavier long-range bullet weights. 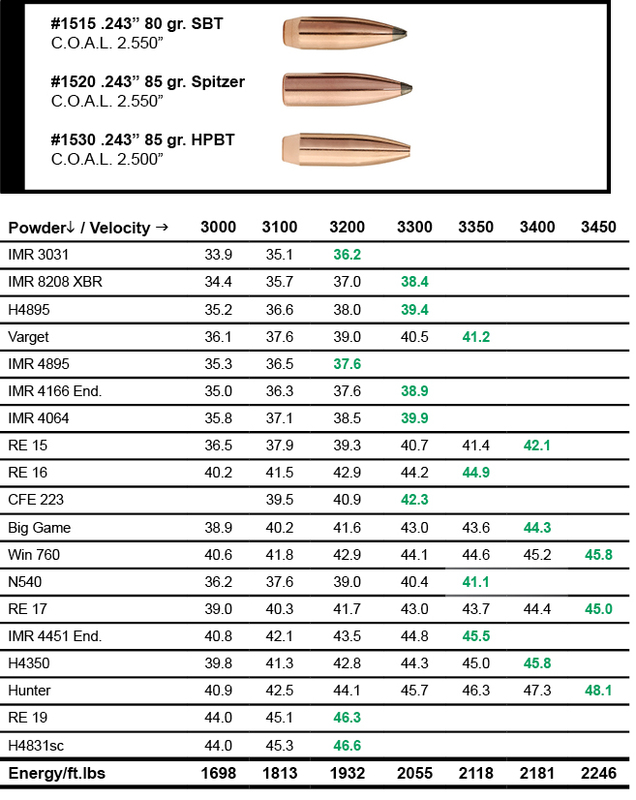 Slightly faster powders such as RE-15, Win 760, and Vihtavuori N540 work well with lighter weight bullets. 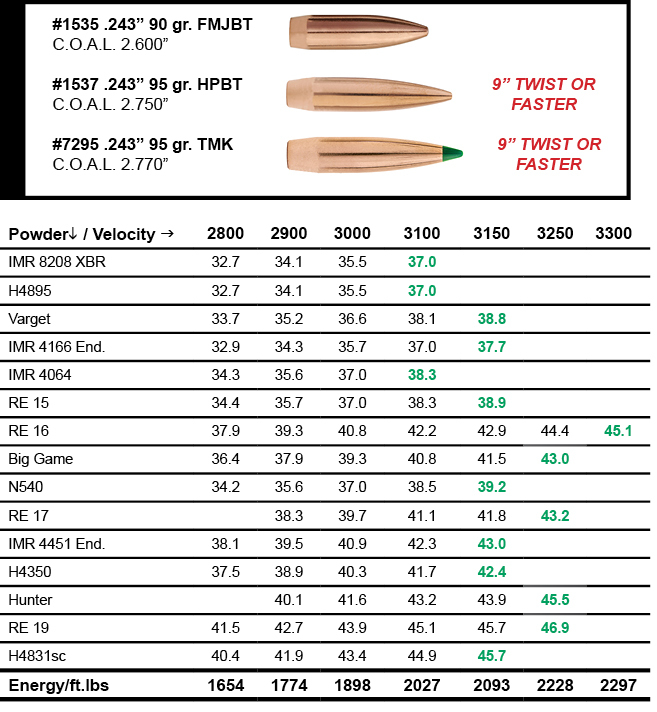 Click here to download the 6mm Creedmoor load data for your 5th Edition Reloading Manual. LOADS LESS THAN MINIMUM CHARGES SHOWN ARE NOT RECOMMENDED. This entry was posted in Load Data, Reloading and tagged 6.5 Creedmoor, 6.5 Creedmoor Load Data, 6.5 Creedmor, Creedmoor Reloading, Load Data, Sierra Bullets Creedmoor, Sierra Bullets Load Data. Bookmark the permalink. Thanks. But the 100 gr. Bullet is showing .264 diameter not the .243 the other pages are showing. Nice – thanks! I’m on the fence between 6mm and 6.5mm, and this is another good reason to look at the 6mm. Finally. Great info. Now how about a new manual? We’re working on it Larry. It’s still going to be a while before we send anything to press, but we’re shooting data for a new one. Hopefully time will allow us to do that cartridge also. Sharps load data is available from manufacturer. Limited. But there. Where is the load data for the 142 g smk? Hey thanks. I found the info I was looking for. 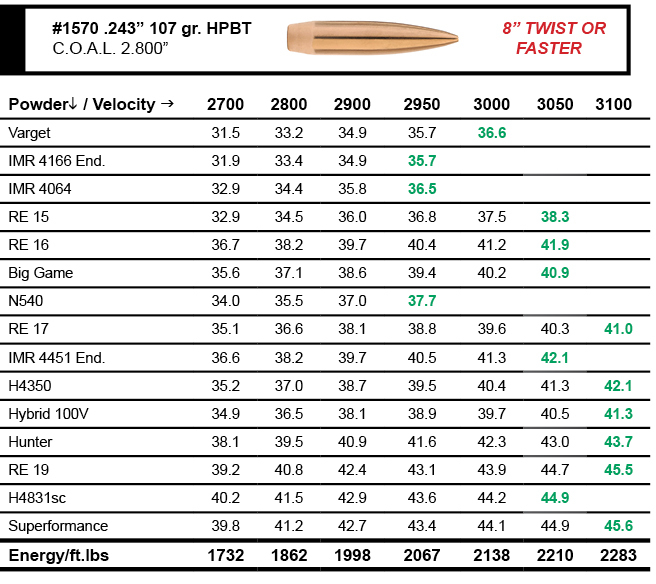 I am looking at the new .243″ 110gn bullet. I will be shooting it in a 6×284 with 1/7″ twist. I am looking at the load data presented here but see no indication as to what cartridge was used to develop this data. 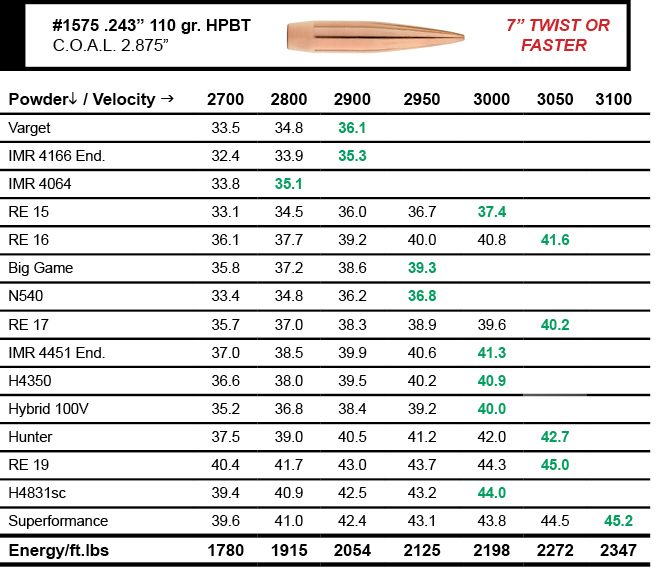 I have been shooting the 107gn bullet to just under 3300 fps so estimate possible 3200 fps attainable with the 110gn bullet. 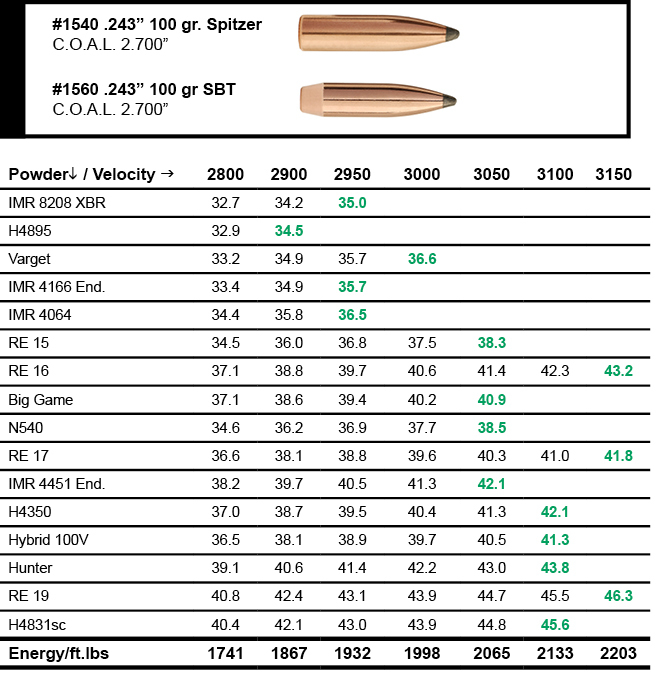 I am using the Sierra infinity ballistic program in my home pc but this program lacks data on this new 110gn bullet. I have no problem developing my own load data but need help in working up ballistic data. Could you please run a program for me with the 110gn bullet just using standard atmospheric conditions at 5800 ft elevation 40* F with a 300 yard zero , please ? Um, this data is for 6mm Creedmoor. dont worry, i found it in a link. shame that need all the powders on the list we can not use here in the UK as Europe are banning the powders. vihtavuori and Swiss Reloader would be good. Why is this page labeled 6mm Creedmoor / 6.5 Creedmoor when they are two different calibers and bullet diameters, and you have a separate page labeled strictly 6.5 Creedmoor? 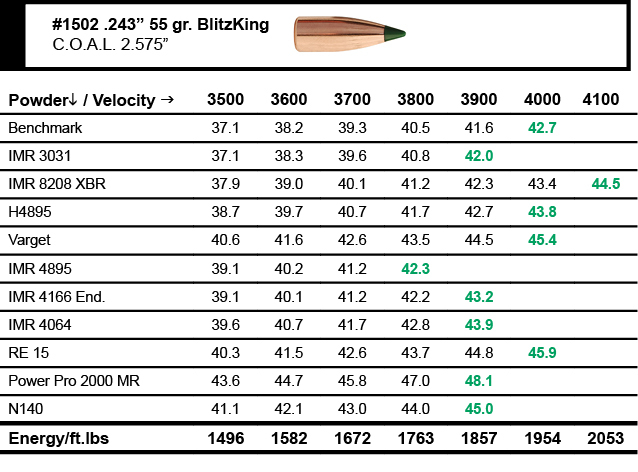 Just trying to figure out why this page, showing .243 bullet load data, has a 6.5 Creedmoor label attached to it? Sorry for the confusion Scott. The official SAAMI drawing has not been released yet. There are firearms, ammo, dies, reamers, etc…., for the 6mm Creedmoor, but no official case drawing has been released. That being said, we had data ready to release. We chose to release it with a cartridge drawing based upon the actual reamer print. Seeing as how the drawing is not SAAMI approved yet, we chose to give it a temporary name as if it were a wildcat by calling it the “6mm/6.5mm Creedmoor”. Looking good! Pleased I chose the 6mm over the 6.5. H4350 paired with the 100gr. SBT should be good medicine for long range coyotes and perhaps whitetails. However, it’s doubtful I’ll give up my 7mm ’08 and 140gr. SBTs for the latter. 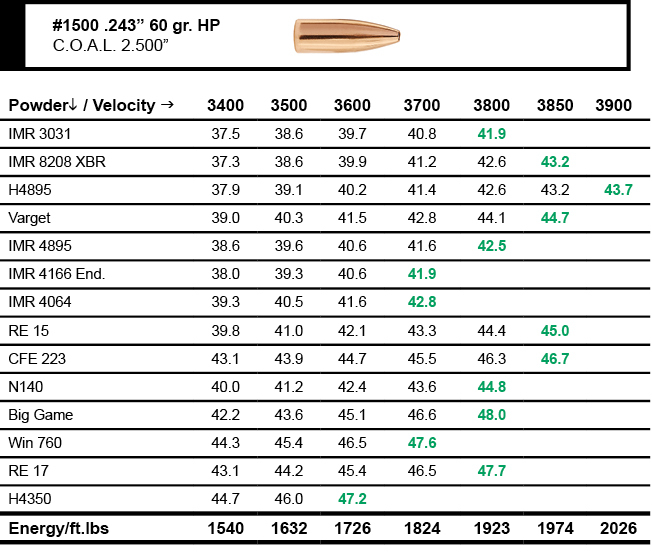 No, the 6.5 Creedmoor data is available here though – https://sierrabulletsblog.com/2017/01/09/sierra-bullets-6-5-creedmoor-load-data/ and can be printed out and added our 5th Edition manual. I’m gonna say no, Randy. I get weird groups with an 8 twist, no keyholes but weird. Can I use this same information if I’m loading 243 Winchester? I can’t seem to find anything on the 110gr Matchking for 243. Thanks. That’s because a .243 won’t stabilize a 110 gr HPBT, unless it has a custom 1 in 7″ or so barrel. Are you going to be testing the 115 DTAC in this caliber? I was told that you make them for David Tubb. If you need some I will gladly mail you some. 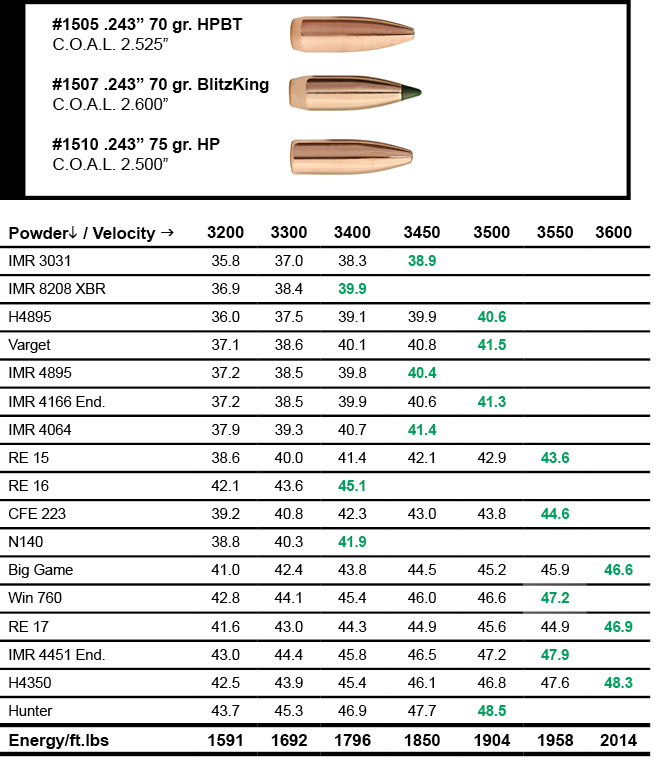 What load would recommend with Norma MRP Powder 70 gr Blitzking??? Have you worked up a load with the SMK 107 with RL 26?